While Libor remains a vestige of a bygone era in which unsecured overnight bank lending still mattered - hence made obsolete by $1.5 trillion in excess reserves sloshing around - traders are puzzled by the sharp move in 3M USD Libor this morning, which on Thursday morning was fixed lower by 4.063bp, falling from 2.73763% to 2.69700%. Libor fell to 2.69700% from 2.73763%, making it the largest one-day drop since May 2009. While Libor, beset by a decade of scandals including massive manipulation that involved most banks during the financial crisis, is on its way out and set to be replaced by the Fed's SOFR alternative in two years, it is still a reference security for trillions in floating-rate debt, and more importantly, remains the primary way to bet on short-term interest rates via eurodollar futures which settle into Libor, and according to Bloomberg, has 12.52 million contracts in open interest, vastly more than Fed Fund futures which have total positioning of only 1.8 million contracts (SOFR remains an experimental speck with just 85K futures after 9 months of existence). As such today's massive move has prompted lots of question, and no answers for the violent move lower. Making matters worse, whereas previously there would at least be disclosure of LIBOR fixing by bank, which in the days leading up to the financial crisis would allow traders to discern which financial institution is suffering from liquidity shortage - and prompted even more Libor manipulation by member banks to hide their financial troubles - the current iteration no longer provides this level of transparency. Or any level for that matter. "That a key benchmark can exhibit such sudden volatility with no observable rationale" is a problem according to Bloomberg commentator Cameron Crise, although according to Nomura's Charlie McElligott, "the move could be driven by an adjustment towards current 90d CP rates" as CP yields have been falling even as Libor has been relatively flat, prompting speculation that Libor was overdue to catch down to CP. BMO strategist Jon Hill shares this view, writing this morning that "our sense is that the move largely represents the market catching up to cash rates, though the speed and severity of the adjustment were faster than presumed." Hill also sees a marked difference between the current period and situation in 1Q 2018; noting that this time around 3-month OIS is steady, while 3-month Libor is declining. He also noted that "it’s not too much of a stretch to claim that not only are short-term borrowing costs not increasing, they’ve declined by half a hike since the December FOMC meeting." 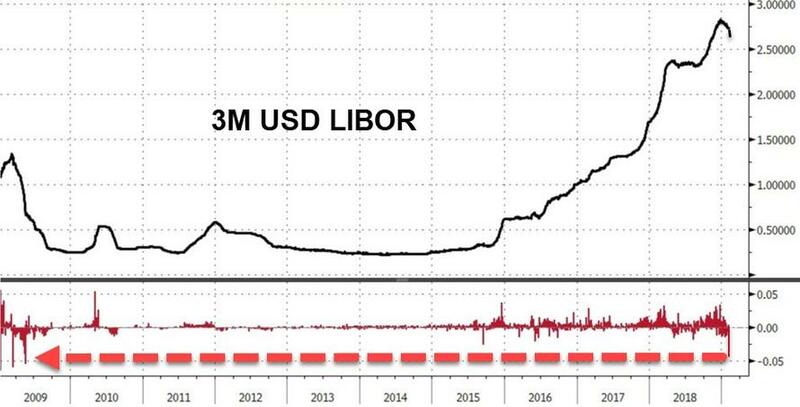 In any case, the sharp drop in Libor appears to be powering today's rally in US rates, even as Bloomberg notes that it "raises the thorny questions of how and why the rate fell so precipitously in one day" adding that it is not a bet on Fed policy as OIS rates have been stable. Some have invited comparisons with the "jumpy" SOFR rate, which is far more volatile than Libor, which is "likely going to be viewed as a bug rather than a feature, but at least you know that the rate is fixed based on hundreds of billions of dollars of transactions." Yet the question in light of today's sharp move is "what drives the Libor fixing?" As of this moment, nobody really knows.